After a spectacular victory in the 2014 Candidates Tournament in Siberia, India’s chess legend will take on Magnus Carlsen for the World Chess Championship. 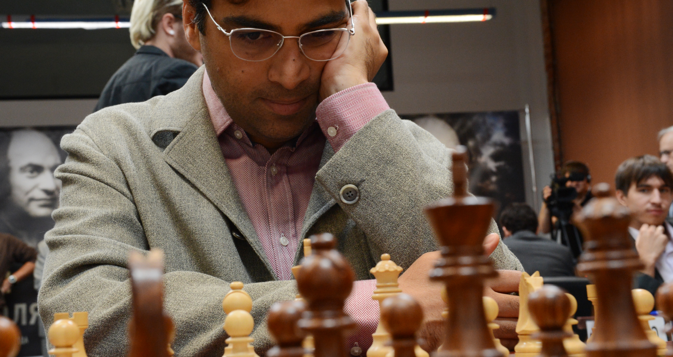 In this interview, Anand talks about his memorable wins over fancied opponents. To say that Viswanathan Anand’s victory in the 2014 Candidates Tournament in Khanty-Mansiysk was a surprise, would be an understatement. He finally agreed to participate just one month before the start of the tournament, and bookmakers were put the odds on his victory as 1 to 55. Now Vishy will be getting ready for his sixth world championship match. The first time he fought for his chess crown was back in 1995, when he lost to Garry Kasparov in New York. Then he defeated Vladimir Kramnik (2008), Veselin Topalov (2010) and Boris Gelfand (2012). After his loss to Magnus Carlsen in Chennai last year, it looked like Anand would not rise again. However, the king, as it turned out, did not die, there is enough young blood his veins, as we find out in this interview. Before the start, nobody thought you could win. Experts thought it would be Aronian, Kramnik... did that upset you? Honestly, I did not care. I came here just to play chess, I was well prepared, I understood that I had as much chances as the other participants. At what point did you start feeling that you could win in Khanty-Mansiysk? As you know, I was sceptical about whether I should play or not. It was not bravado. At first, right after the match with Carlsen I was really asking myself if I wanted to continue. I made up my mind finally only after a conversation with Kramnik in London in December. We went to dinner, and Vladi said to me: “Of course, play. You can always say no!” I am grateful to him for his support. It was important. It started very well for me, it was probably then that I believed in the possibility of me being in first place. For me it is very important to start well. And here in the first game – I won over Aronian. Were you surprised that Levon practically couldn’t impose a fight with the black? It’s not that I was surprised. It so happens that you prepare, and then you see the position on the board and cannot remember how to react appropriately. Compared to the usual arrangements, the white didn’t have anything, but Aronian failed to equalize the score. And then you have won the game of black over Mamedyarov. I am very pleased with that game. I was able to feel the opponent’s mood, what he was going to do, and in a few moves, I turned an approximately equal position into a winning one. Which game was the most exciting? Probably, the one with the black against Aronian in the eighth round. At the time, we had an equal number of points with him, and he was very determined. But he had no luck in the debut. Of course, Levon confused me with his choice, but... this was not the case when it was worth worrying about the result. I managed to come up with a pawn sacrifice, to take the initiative, and he wanted to finish everything as quickly as possible. When Topalov was defeated, Kramnik and Aronian synchronously lost, did you have a feeling that the tournament was over? It is a big mistake to think so, five rounds before the finish. Yes, I was one point behind them and I had the advantage over Aronian in individual games, but if during the game you don’t think about your current position, but how to keep your lead, nothing good will come of it. This has happened a few times in my career. I simply tried to play chess, without seeing or hearing what is happening around me. Did you ever go out of the hotel during the tournament? Yes, I went out... In the beginning of the tournament, I caught a cold though, which was not surprising when, instead of a thirty degree heat, there were snowdrifts and strong winds in the street. Then everything was normal in that respect. I did not feel like a recluse. There was enough communication – I always kept in touch with home, and Chanda (Chanda Sandipan –is Anand's only helper in the 2014 contenders tournament) would not let me get bored. What did you feel when you became inaccessible to competitors? Relief. Still, it's a lot of stress – every day you have to play against the world’s best players, especially when you are in the lead, and everybody expects you to stumble. In the 13th round Karyakin did not allow you to enjoy the moment for a long time. I can understand it; he tried to use his chance. The last two rounds were generally quite thrilling for me, despite the fact from the side it seemed like everything had been decided. During the tournament, I mainly followed Aronian, and suddenly I realized that if I lose to Karyakin, and he wins in the last round, he will overtake me. It was important not to show any weakness in this situation, not to spoil your mood. Kramnik said that you won because you made the least mistakes. Is it nice to go undefeated in such a tournament, even without the worst positions? I have had the worst positions. Black with Topalov, Kramnik, Karyakin, although I messed up ‘out of joy’ as it was my debut. If you recall the Mexico 2007 (same tournament, but with the World Championship status, and won by Anand), where I also managed not to lose even once. Do you have a feeling that having won in Khanty-Mansiysk, you became a champion of ‘the rest of the world’? Hmm ... What do you mean? The number of your individual games with Carlsen recently. (Reflects.) Okay, let's be honest. Recently, I didn’t really do well with Carlsen, but it does not mean that I have no chance. Yes, in the first match I had some kind of an inevitability curse, and towards the end, my game really went wrong. In truth, I do not want to remember. I think that now everything will be different. In other words, you are not afraid of a rematch? I've been afraid of nothing for a long time (smiles). Do you have an answer to the question of how to win over Carlsen? We will find out in November. Do you intend to create a new team or are you happy with the old one? What would you call your success: renaissance, or maybe a miracle? Definitely not a miracle. I was preparing for a tournament, I knew what was waiting for me. Renaissance? There is something in it, I really have never been the first in such a company. How will India meet its hero? In the recent days I have received many congratulations. I am afraid to even to imagine what our newspapers wrote. In any case, life goes on! First published in Russian in Sport-Express.